To convey the family unity of Leontes, Hermione, and Mamillius, the three perform a pas des trois in which they remain constantly in physical contact with each other as Mamillius becomes something akin to a graceful needle threading around and through his parents. The National Ballet of Canada, The Kennedy Center Opera House, Washington, D.C.
What ballet versions of William Shakespeare's plays lack in language they can make up for in visual imagery and deep explorations of a character's soul—not to mention the athletic artistry of ballet dancing. As with painting, sculpture, music, and many other art forms in addition to theater and cinema, ballet is a perfect medium for the works of Shakespeare. Yet, few of Shakespeare's plays have been turned into ballets: Romeo and Juliet is a fixture in most companies' repertoires, but A Midsummer Night's Dream and Othello are the only other plays to get any significant ballet treatment. Therefore, Christopher Wheeldon's and Joby Talbot's The Winter's Tale is a welcome entry in the genre, especially in the capable hands—bodies and legs, too—of the National Ballet of Canada, a company with as deep a stable of dancers as I've seen in London or New York. Co-produced with England's Royal Ballet, The Winter's Tale premiered at the Royal Opera House in London in 2014 and had its Canadian premiere last November at Toronto's Four Seasons Centre for the Performing Arts. We caught the touring production at the Kennedy Center in Washington, D.C., and the company will be presenting the ballet as part of the Lincoln Center Festival in New York City July 28–31. It's a don't-miss event. Like Shakespeare's script, Wheeldon's choreography can jar you and thrill you moment to moment. I would apportion the style of dance as 50 percent classical, 40 percent modern expressionistic movement, and 10 percent yoga, as dancers do as much movement with their hands and heads as they do their legs. Raised on more traditional ballet, I'm not particularly fond of some of the stiffly rendered expressionistic movements in Wheeldon's choreography, but another aspect of modern dance—multiple dancers executing lifts and interlacing body flows—gives this ballet its most breathtaking moments. To convey the family unity of Leontes (Evan McKie), Hermione (Jurgita Dronina), and Mamillius (Antony Tcherny, a youngster already displaying exquisite dancing and acting skills), the three perform a pas de trois in which they remain constantly in physical contact with each other as Tcherny's Mamillius becomes something akin to a graceful needle threading around and through his parents. Leontes, Hermione, and Polixenes (Brendan Saye) dance a similar pas de trois to demonstrate their strong friendships, with Dronina's Hermione serving as the thread that binds. Telling the story entirely by visual presentation, Wheeldon shows us the backstory of the two kings growing up as lifelong companions. The boy dancers segue to McKie and Saye as they become the kings of Sicilia and Bohemia, respectively. We see Leontes courting and wedding Hermione and Mamillius joining them soon after. Then, Polixenes arrives for his visit, the point at which Shakespeare's story begins. The ballet gives us a key moment when Hermione asks permission of Leontes to dance with Bohemia, which he freely grants. This establishes her innocence before Leontes makes his accusation of adultery. His "Too hot, too hot!" moment comes when she feels the baby kick and she places both men's hands on her belly. It's an innocent gesture on her part, but Leontes immediately goes dark with jealousy. As the rest of the cast remain frozen in tableaux, to a suddenly discordant score McKie performs a herky-jerky dance of weird leg kicks and mechanical movements with his arms and head expressing paranoia. The ballet has a few significant plot and character departures from Shakespeare's play. Leontes attacks Polixenes in public at the party—there is no quiet conspiracy to murder the Bohemian king (and no Camillo: his role in the Bohemia scenes is given to a character called Steward, danced by Brent Parolin). This change undermines the following scene in the nursery: In Shakespeare's version, Hermione has no idea what's coming when the angry Leontes enters; here, having already seen his jealousy on full display, she enters full of worry but ready to make the best of things as she plays with Mamillius. The ballet has no Apollo oracle (no great loss); instead, Mamillius, who, carrying a teddy bear, had snuck in to watch the trial, collapses upon hearing his father's sentence, and Hermione collapses shortly after. One other departure from Shakespeare's script: no Autolycus. Some (my wife included) would argue this is no great loss, either. I accept that the rogue does little to advance Shakespeare's plot, but he's such a singular invention and would have been good for a fun character dance in a ballet of this sort (along the lines of the Widow Simone's clog dance in Frederick Ashton's La Fille mal gardée). Much of the rest of the plot remains intact, including Antigonus being pursued by a bear, the former played by Jonathan Renna, the latter a projection on a huge sheet (the Daniel Brodie–designed projections on screens at the back of the stage include images of seasons passing and ships at sea). Meanwhile, Wheeldon's choreography and the staging by Jacquelin Barrett and Anna Délicia Trévien enhance many elements of the plot. Statuary becomes a prevalent image throughout the Sicilian scenes—one example is Leontes moving among a set of statues as he spies on Hermione and Polixenes in the garden—creating a visual contrast to the wildly natural set of the Bohemian scenes. Leontes enters the nursery with guards evoking the look and manner of Nazi storm troopers. When he orders Hermione to prison, she curtsies in acquiescence, a touching gesture, but she refuses to be handled by the guards, instead walking off with them of her own accord, a display of her grace and royal bearing. In the trial scene, Dronina expresses the elegance of Hermione's speech through an achingly moving dance. 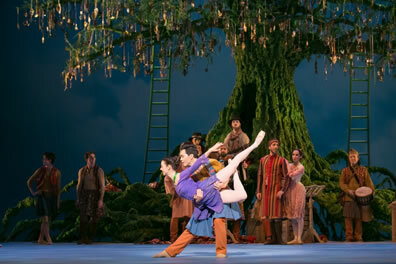 The ballet's Act II is the production's high point in every aspect of the art form: the dancing, Talbot's commissioned score, and Set and Costume Designer Bob Crowley's colorfully rural Bohemian costumes and a bluish-green tree filling up the back of the stage with pendants hanging on the branches and a tangle of roots spreading out across the floor. When the curtain opens on this set, the audience applauds. Florizel (Francesco Gabriele Frola, making his debut in the role) is lying lazily among the roots on one side while a flute player plays an extended prelude on the other. This is the contented calm before the joyful explosion of a soaring score and exuberant dancing by the whole corps. Watching it, I realized how Shakespeare created an ideal scene for ballet, for not only does he give us ready-made the ensemble dances, he provides plenty of opportunities for solo dances and various pairings, starting with yet another delightful family-unit pas de trois featuring Father Shepherd (Donald Thom), his son "Brother Clown" (Robert Stephen), and Perdita (Elena Lobsanova). Lobsanova and Frola dance their pas de deux full of love and newfound joy: he displays graceful athleticism, and she is luminous—she's not just a light, she's the filament. The whole sequence is rich with such moments, from Florizel slipping in and out of the villagers' lines (a metaphor for this prince weaving into the fabric of peasant life) and Stephen as Brother Clown getting his own fun-filled dance and flirtatious pas de deux with the Young Shepherdess, danced by Meghan Pugh. All the while at the back of the stage, a "Banda" is performing with ethnic instruments—bansuri, dulcimer, accordion, and percussion—incorporated into the score the orchestra is playing in the pit. Also back there is King Polixenes disguised as a guitar player, who, upon revealing himself to Florizel and Perdita, sends the ballet and score into more discordant passages heading to the last act. Perdita and Florizel perform their pas de deux as a Banda joins the corps of dancers on stage in the National Ballet of Canada's production of William Shakespeare's The Winter's Tale. This photo shows Jillian Vanstone and Naoya Ebe as Perdita and Florizel. Photo by Karolina Kuras, The National Ballet of Canada. The ballet's final act pretty much follows Shakespeare's lead, except that Polixenes is slow to accept the remorseful Leontes' apology (ballet perforce stretches out all such pivotal emotional moments). Also, the statue Paulina unveils for the court includes Mamillius with Hermione, but only Hermione comes to life. She does so in a way that, even after all you've seen, exceeds your expectations with a heart-stirring dance of grace and forgiveness to Talbot's majestic composition. However, the ballet does not end on that happy note. Pointing to the fact that Shakespeare's "comedy" includes two significant tragedies, the deaths of Mamillius and Antigonus, Paulina is left alone, bowing in grief before the statue of Mamillius. Indeed, this version of The Winter's Tale could be Paulina's story, as danced by Svetlana Lunkina. Her performance does not have the athleticism of Dronina's Hermione nor Lobsanova's Perdita, but Lunkina's expression-filled movements provide the ballet's emotional core, from her dances with Mamillius, of whom she is particularly fond, to her presentation of the baby Perdita to Leontes in which Paulina angrily and heroically gives the tyrannically jealous king a fervent what for. After the death of Mamillius and the supposed death of Hermione, Lunkina performs a dance of anger turned to sorrow and, finally, turning to consolation in which she literally pulls Leontes through his own grief and remorse (and this is the proper use of the word literally here in describing what Lunkina and McKie achieve with Wheeldon's choreography). This ballet also interpolates a scene in which Paulina bids farewell to her husband, Antigonus, as he carries the baby aboard the ship and toward his doom. I doubt such an additional scene would work so well in a textual telling of Shakespeare's The Winter's Tale, but in dance it is so right and, as done here, so Shakespearean.